A Meet and Greet in New Haven and a Grand Opening of Democratic Headquarters were highlights for the Democratic Party last week. A Democratic candidate Meet and Greet took place Sunday at the New Haven Community Center while a ribbon-cutting ceremony was held at Democratic Headquarters, located at 2709 Jackson Ave. in Point Pleasant, took place Saturday. Local and state candidates addressed the crowd Sunday by speaking about local and state issues and encouraged those attending to vote. Del. Scott Brewer of the 13th District spoke about recent legislation that he considers harmful to the majority of workers such as the right-to-work bill, which he feels guarantees lower wages for workers. He also spoke of the need to protect education by providing adequate pay and benefits for teachers, thus ensuring the state keeps quality teachers. In addition, Del. 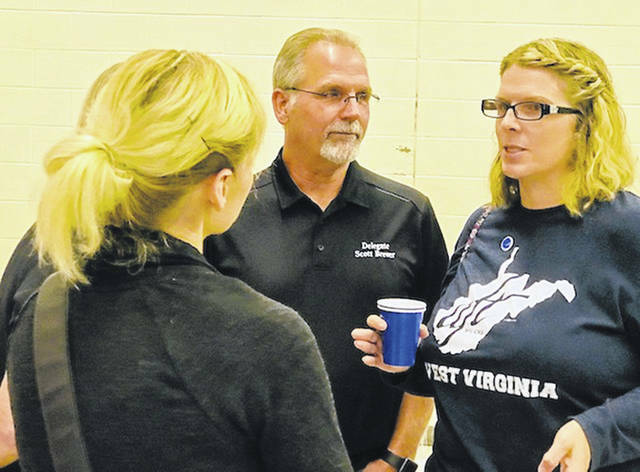 Brewer talked about the legislature’s recent handling of the WV Supreme Court. As a result of legislative action, voters will elect two new state Supreme Court justices, one in Division I and another in Division II, this November. Two Supreme Court candidates, one from each division, also spoke to the group. Dennise Smith, a Charleston attorney, with over 20-years experience and a WVU graduate, has argued cases before the WV Supreme Court and participated in appeals in federal court. She has been a staff attorney in the WV Legislature and served as an administrative law judge for Workforce West Virginia. She is the daughter of former Democratic Party leader Chuck Smith. Judge Joann Tabit, a graduate of Marshall University and of WVU College of Law, was appointed to the Kanawha County bench in 2014, then was elected in 2016. Currently, she presides over the county’s Juvenile Drug Court. Judge Tabit calls for public transparency to prevent further corruption in the court. Brian Prim, candidate for the WV Senate in District 4, spoke about the need to keep jobs local by reversing legislation which gives contractors the right to bring in cheap labor. He stated that he will work to end taxing social security benefits in West Virginia and to fight for better pay for public employees. Prim, a native of West Virginia, also opposes denying coverage to individuals with pre-existing conditions. He is an attorney and a farmer. Suzi Caldwell, candidate for Mason County Circuit Clerk, talked about the duties of the Circuit Clerk and the importance of having an experienced person in that position. Lack of experience in the area could lead to chaos in the court system, she stated. Caldwell, who has been acting clerk since the retirement of Bill Withers, the former clerk, has been employed in the Circuit Court system for years. Some candidates who could not be present sent representatives to speak for them. Speaking for Sen. Joe Manchin was John David Morgan, who manages the Manchin campaign locally. Floyd Sayre, executive committeeman, spoke on behalf of WV Senator Richard Ojeda, who is running for the U. S. House in District 3. Jerrie Howard, president of Mason County Democratic Women, spoke for Pauletta Randolph King, candidate for Mason County Commission. Howard also served as MC for the event. Providing entertainment for the event was the country/bluegrass band “Bobby Maynard and Breakdown,” featuring Maynard, Jason Jeffers and Wes Jeffers. Mason County Democratic Women, which hosted the event, provided hot dogs, desserts and drinks to local and visiting Democrats.